Christie's contemporary art sale held this week in New York was the most expensive single auction in history, raking in $745 million. 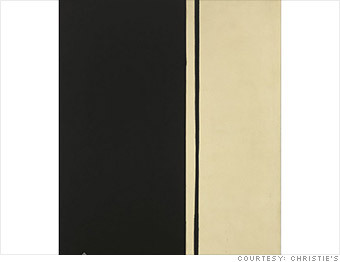 The top-selling work of the evening was also the world auction record for artist Barnett Newman, who died in 1970. His previous record-selling painting was "Onement VI," which sold last year at Sotheby's for $43.8 million. The use of a black palette in this piece is similar to his other work of that time period. "Newman wanted to handle the raw canvas, relative to the black, in such a way that it would 'become color' and possess its own sense of light," according to a profile of the artist by the Philadelphia Museum of Art. The buyer of "Black Fire I" remains anonymous.